As assistant editor of Speculum and first time attendee of the annual meeting of the Medieval Academy of America, it was incredible to see everything come together for this extremely successful meeting. There were 526 total registrants at the meeting–much higher than we had anticipated given the shell shock left over from last year’s almost snowpocalyptic February. This is a testament to the strong and committed membership base that we have at the Academy and the wonderful people behind the scenes who worked tirelessly to organize and run the meeting. I spent most of my weekend working at the registration desk with our graduate student volunteers and running around to make sure things were progressing smoothly. Our corps of volunteers was spectacular and many went above and beyond by showing up for extra shifts because they wanted to help. Not only was their assistance greatly appreciated, but I also thoroughly enjoyed getting to spend some time with my peers discussing what everyone was studying and what projects they are working on. At the registration desk and at the banquet on Friday evening, I also had the opportunity to meet many people whose names I have only seen on book covers or whom I have emailed with in regards to book reviews for Speculum. It was wonderful to be able to finally put faces to the many names of scholars whom I had corresponded with previously through Speculum but had not yet had the chance to meet in person. 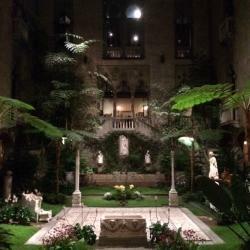 The closing reception at the Isabella Stewart Gardner museum was the perfect end to a wonderful weekend. It was breathtaking to see the museum illuminated at night for our enjoyment. I was thoroughly impressed with my first experience at the annual meeting of the Medieval Academy of America and it will not soon be forgotten. Those who remember last year’s Boston winter were likely nervous when they received their invitation to attend the 91st Annual Meeting of the Medieval Academy of America at the Hyatt Regency in downtown Boston from February 25-27, but thankfully this year’s weather cooperated and Boston, with its numerous top-tier medieval studies institutions, proved to be the perfect setting for this year’s conference. This was my first year to attend the annual meeting, and as the current Editorial Assistant at Speculum and a doctoral candidate in History at Rutgers University, the conference gave me the chance to put faces to the names of senior scholars whose work has informed my own research, as well as to connect with other junior scholars who share my research interests. Over the course of the weekend, conference attendees were challenged to push against established narratives and trajectories in medieval studies. Plenary talks from Laura A. Smoller and Richard Kieckhefer challenged audience members to reconceptualize the triad of religion, science, and magic in the Middle Ages, while Robin Fleming’s talk on Britain’s transformation from Roman to Medieval reimagined models of periodization. This year’s meeting once again offered participants a glimpse at the future of medieval studies: the opening plenary from William Noel reflected on the “Future of Medieval Manuscript Studies” through access to digital content. Four panels on digital humanities and medieval studies–including one standing-room-only “interactive” session–invited attendees to continue to think about the medievalist’s role in digital scholarship. Panels on ecocriticism, disability studies, and women’s and gender studies, along with Barbara Newman’s Presidential Address on “Annihilation and Authorship: Three Women Mystics of the 1290s,” all reflected the Academy’s commitment to diversity both in scholarship and membership. This commitment was further affirmed in a Statement on Diversity and Academic Freedom read by the Medieval Academy’s President Barbara Newman and distributed to participants at the close of the annual business meeting. The MAA meeting offers young scholars like myself a chance to see first-hand a diverse and far-reaching network of scholars working in medieval studies. Often in our own departments medieval studies can feel marginalized, but there is nothing quite so invigorating as listening to an engaging paper or sharing a glass of wine with a like-minded scholar from an institution across town or across the Atlantic. At 526 registered attendees, this conference was one of the largest ever in MAA history, but even so, I had numerous opportunities to develop relationships with other participants as we crossed paths over the course of the weekend. In short, I urge other junior scholars to consider attending next year’s meeting in Toronto, which surely will be another opportunity for us to forge connections with our fellow scholars and use our shared interest and expertise to conceive of new ways of thinking about and, just as importantly, teaching about the Middle Ages.